"You flip the dosimeter, wear it on the shoulder, wear it inside the sock, whatever it takes to lower the dosage displayed and work longer in high radiation areas. TEPCO doesn't specifically order the workers to do this, but to complete the work within the manpower, budget and the work specification given by TEPCO there is no other choice. So the workers are supposed to be doing this voluntarily, and when a problem arises they can say the workers did it on their own." Tomohiko Suzuki is a journalist who managed to sneak into Fukushima I Nuclear Power Plant as a temporary worker from July 13 to August 22 this summer to find out what it was really like. He fitted himself with a 007-like pin-hole wristwatch camera and took photos. He was finally caught and dismissed when the plant management got suspicious of him, because he was always on the front-row seat taking copious notes during the lectures given at the plant, he said. The Foreign Correspondents' Club of Japan invited him to give a talk on December 15 about his experience and his observations, as his new book "ヤクザと原発　福島第一潜入記 (Nuke Plant and Yakuza - Infiltrating Fukushima I Nuke Plant)" is published. The picture he paints is decidedly not as innocent-looking like that of the other plant workers who regularly tweets about their work and life inside the plant. The following is my partial translation of Suzuki's talk, as it was summarized on BLOGOS. If you understand Japanese, the entire talk (nearly 2 hours) is available on Youtube, here. It looks worth watching, and it has the video Suzuki took inside the plant. Setting aside the issue of whether nuclear power generation should continue, the situation of Fukushima I Nuclear Power plant is, bluntly speaking, out [as in baseball]. The US military initially set the evacuation zone at 80 kilometer radius, and I think that was the right decision. When you measure the radiation levels, Nakadori of Fukushima Prefecture [middle third] has high radiation and bad contamination, totally the level of a radiation control zone where the entry of the general public should be banned. But I believe the Japanese evacuation zone was set at 20 kilometer radius, in order not to evacuate [people living in] big cities like Iwaki City, Fukushima City and Koriyama City. All the nuclear engineers that I have interviewed say "People are living in the areas that they shouldn't be living in", and "It is the same as living inside a nuclear power plant". Much-touted "all-Japan" cooperation inside the plant: Where is it? Hitachi and Toshiba are both working inside Fukushima I Nuke Plant. But what Hitachi is doing is not disclosed to Toshiba, and what Toshiba is doing is not disclosed to Hitachi. They deal with issues on their own. They would make more progress if they cooperated. This is the latest information. The government did the makeshift construction trying to hasten a cold shutdown. For example, many of the pipes for the contaminated water are plastic, with temporary connections. They have short life, and there is a danger of freezing. Right now, they are doing their best to clean up the mess resulting from the makeshift jobs. There are 6 reactors and 4 reactor buildings [that are damaged?] at Fukushima I Nuke Plant, and they don't have accurate data on any of them. I hear that IHI will finally enter the Reactor 2 building, but there is no knowing of what has happened to the fuel pellets inside the reactor. The reality is, all they could do is to repair the roads and cool the reactors. I am very fearful of what may happen, when I think about the future maintenance work. You, as foreign media correspondents, may have mistrust against the Japanese government and TEPCO. But not all the information from TEPCO is a lie. TEPCO answers the questions tailored to the level of knowledge of the questioner. So please, as journalists, study nuclear energy and be armed with knowledge and draw information out of TEPCO. I agree with his assessment of TEPCO. I was watching TEPCO's press conference in March, and at that time then-Vice President Muto was on hand to answer questions. I had a distinct feeling that he was extremely bright, and was not answering the questions unless the questions were intelligent enough for him to offer new information. It was not that he was evading or lying; he was simply not offering information to people who he deemed wouldn't understand anyway. Not so about the current spokesman, who can lie through his teeth without thinking anything of it. This may be an extreme argument, but the Japanese nuclear industry is built on injustice [or illegality]. It is built on workers forced to get exposed to radiation. Officially they are not exposed to radiation, but for example, workers put on dosimeters on their breasts when the enter high radiation areas. There is a front side and back side to a dosimeter. Just by flipping the dosimeter inside the breast pocket, a worker can work 10 more minutes. When the high radiation area is above him, a worker puts his dosimeter in one of his socks. Then he can work 30 more minutes. If the work is on the reactor and the high radiation area is below him, a worker wears his dosimeter on the shoulder. TEPCO doesn't specifically order the workers to do this, but to complete the work within the manpower, budget and the work specification given by TEPCO there is no other choice. So the workers are supposed to be doing this voluntarily, and when a problem arises they can say the workers did it on their own. Plausible deniability. Traditional Japanese way. Flipping the dosimeter to lower the radiation dosage may be in the second set of work manuals. It may not be written but everybody knows. The management (TEPCO) knows but doesn't say a word as it is not supposed to know. "I know that you know that I know. But let's not talk about it." Vanity Fair: US Medical Researcher Robert Peter Gale Reassures Fuku-I Workers "Nothing to Worry About"
Following Dr. Wade Allison (1 sievert/year is safe) and Dr. Theodore Rockwell ("Let people of Fukushima return!") here's Dr. Robert Peter Gale, who actually went to Fukushima Prefecture at least and told the workers at Fukushima I Nuclear Power Plant not to worry too much and not be caught in a radiation "hysteria". Dr. Gale tells a worker who's getting 1.67 millisievert every 2 hours that it's OK up to 250 millisieverts under the circumstances. The Vanity Fair magazine article doesn't say under what circumstance Dr. Gale went to Fukushima. I can't figure out the reason why Vanity Fair wrote this article either. he three men, all in their 30s, might be any construction workers knocking back Sapporos at a tiny izakaya, or neighborhood bar. Around them is the friendly clutter of any small, working-class drinking place in Japan. Fading calendar portraits of a favorite singer fill every last inch of wall space not given over to bright posters for ocean resorts, photos of kimonoed actresses striking classical poses, or plaques on which celebrities have inscribed their autographs. There’s even a framed snapshot of the old-broad proprietress next to the celebrated tough-guy director and TV star Beat Takeshi. Just In: 348 Bq/Kg of Strontium Discovery in Tokorozawa City in Saitama? For now, the information is via the tweets of people who watched the press conference online. It was during the question by Yasumi Iwakami, independent journalist, during the press conference at the Nuclear and Industrial Safety Agency, who has declared there was/is/will be no water leak from Fukushima I Nuke Plant. 348 becquerels/kg of radioactive strontium was discovered in Tokorozawa City in Saitama Prefecture, according to Iwakami. As I posted yesterday, NHK quoted the US Deputy Secretary of State expressing a strong interest from the US companies to participate in Japan's decontamination (bubble), after he congratulated the administration on this important milestone. Well, he was not alone. It looks like a whole delegation of the US government has been quietly in Japan, negotiating with the extremely pro-US Noda administration for a big piece of "post"-accident bubble in decommission and decontamination, to be paid for by the hapless Japanese taxpayers. Sovereign capture is so complete. Or it always has been. State of Cold Shutdown: Hosono Says "No One Knows Where the Fuel Is, But I'm Confident It is Cooled"
Minister of the Environment Hosono expressed some concern that "No one knows where the fuel is until we open the reactors", but he reaffirmed the cold shutdown, following the lead of his prime minister. He said, "No matter where the fuel is, it is being cooled". His home was in Tsushima District of Namie-machi, northwest of Fukushima I Nuclear Power Plant. It has been disclosed that a man in his fifties were found dead earlier this month in his home in Tsushima District in Namie-machi, which is designated as "planned evacuation zone" after the Fukushima I Nuclear Power Plant accident. The man had come back from his temporary stay in Fukushima City where he had evacuated. According to the Futaba Police Department, the death is considered suicide. According to the Police, he must have used a kitchen knife at home and stabbed himself in the stomach. There was no suicide note left. The man was staying at his relative's house in Fukushima City, but he left, saying he was going to take a look at his home. When he didn't come back, the relative visited his home in Tsushima, and found him dead. At this point, I can only laugh. Totally predictable. As the national government under Prime Minister Noda (who looks like a popular manga character Patalliro, except Pata is extremely smart) prepares to declare a cold shutdown "state" and is about to become the laughing stock of the world, the Nuclear and Industrial Safety Agency is busy rewriting the definition of "leak". Tokyo Shinbun reports that NISA has decided to basically "nullify" the leaks of contaminated water from Fukushima I Nuclear Power Plant in the past, and declare that there will be no leak in the future either, even if there is actually a leak or deliberate discharge. Why? Because NISA says so. There have been several leaks of water contaminated with radioactive materials from Fukushima I Nuclear Power Plant. Tokyo Shinbun has found out through own investigation that the Nuclear and Industrial Safety Agency under the Ministry of Economy, Trade and Industry has treated the amount of the leaks as "zero" from a legal [or regulatory] point of view, because it was a "state of emergency". The Agency has said it will treat the future leaks and deliberate discharges into the ocean the same way. The national government is scheduled to declare a "cold shutdown state" on December 16, but we are suspicious of the government's position that seems to ignore the suppression of the radioactive materials released from the plant, which is one of the important conditions [of the cold shutdown "state"]. The Nuclear Reactor Regulation Law specifies that the operator needs to set the maximum amount of radioactive materials released into the ocean for each nuclear power plant (total emission control). In the case of Fukushima I Nuke Plant, the maximum amount allowed is 220 billion becquerels per year for radioactive cesium. The amount is set to zero again at the beginning of a new fiscal year. However, a leak of highly contaminated water was found on April 2 near the Reactor 2 water intake, and TEPCO conducted a discharge of low contamination water that was stored in a tank inside the plant buildings to make space to store the highly contaminated water. This leak and the discharge alone released radioactive materials outside the plant to the tune of 4,700 terabecquerels (according to TEPCO's estimate), already more than 20,000 times as much as the maximum amount allowed. Both domestic and foreign research institutions have disputed TEPCO's estimate as "too low". Furthermore, the storage tanks that are set up inside the compound are expected to become full in the first half of the next year. The water in these storage tanks also contains radioactive strontium. TEPCO is contemplating the discharge of the water into the ocean after further decontaminating it, but facing the protest from the fisheries associations the company has said it will postpone the discharge for now. Responding to the questions from Tokyo Shinbun, NISA emphasized that responding to the accident came first, and Fukushima I Nuke Plant was in a "state of emergency" where it was not possible to stop the leak, due to the damage the plant had sustained, and that was the reason for not applying the rule of "total emission control" and treating the 4,700-terabequerel leak as zero leak. The special treatment under the "state of emergency" will last until the accident winds down, according to the Agency; but it was vague as to how long the special treatment will last, saying "it will be decided in the future discussions". The Agency said even if the treated water that contains radioactive materials is released into the ocean, the Agency will continue to treat it as zero release. Well, why should NISA stop at the water leak? They should simply declare that there was no emission of radioactive materials in the air, because the plant was in a state of emergency and in no shape to prevent the emission. The national government declaring a cold shutdown "state" on broken reactors without even knowing where the corium has gone; government experts declaring 20 millisievert radiation is totally OK after one-month deliberation; the government agency declaring there was, is, will be no contaminated water leak or discharge from Fuku-I even if there was, is, will be a leak or discharge. The relationship between low-dose internal radiation exposure and bladder cancer cannot be proven. Above points are from the article in Mainichi Shinbun 12/15/2011, the only paper that had any critical thinking on this issue. All the other large-circulation newspapers and NHK simply parroted what was said by the experts and the government officials. "So, 20 millisieverts per year radiation means people can live there." This working group of so-called experts met for about a month to discuss the risk of "low-level" radiation exposure (meaning less than 20 millisieverts per year) and make a decision. Now they have made the decision and submitted the report to the government, the government duly accepts the independent experts' opinion, declares 20 millisieverts radiation to be an acceptable guideline, and plan accordingly. The government is set to convene a cabinet meeting in the evening and declare a "cold shutdown state" and will soon declare certain municipalities within the 20-kilometer radius "no entry" zone to be now "safe" to return (see my previous post). In that country, if the government declares "one plus one equals four", or "tomorrow the sun rises from the west", people are expected to say "of course", and the calculators would start showing one plus one equals 4 and the sun would rise from the west. Or at least they would try. The land of miracles. 20 millisieverts per year of radiation exposure for the general public. There is no mention of different standard for children, except for the "effort" that the government is supposed to exert to lower the radiation for children. Radiation control zone is 1.3 millisieverts per 3 months (5.2 millisieverts per year). The area within the 8-kilometer radius from Fukushima II (Daini) Nuclear Power Plant has been designated as "evacuation" zone following March 11 earthquake/tsunami and the residents have been evacuated. The Japanese government has decided to abolish that zone by the year-end, paving the way for the residents of Okuma-machi, Naraha-machi, Tomioka-machi, and Hirono-machi to return. Never mind that Okuma, Naraha, Tomioka also happen to fall within the 20 kilometer-radius "no entry" zone for Fukushima I (Daiichi) Nuclear Power Plant. The Nuclear and Industrial Safety Agency under the Ministry of Economy, Trade and Industry told the municipalities within the 8-kilometer radius "evacuation" zone around Fukushima II (Daini) Nuclear Power Plant on December 13 that the evacuation order would be lifted shortly. According to the people involved, the national government is to indicate its thinking about how to redesign the "no-entry" zone within the 20-kilometer radius from Fukushima I Nuke Plant and the "planned evacuation" zone [between 20 and 30-kilometer radius] before the year-end. The "no-entry" zone for Fukushima I includes the evacuation zone for Fukushima II. By lifting the evacuation order for Fukushima II first, the government may be trying to create a favorable environment in which to revise the "no entry" zone for Fukushima I. Revision of the evacuation zones is to be carried out by the national government on the completion of the "step 2" of the roadmap to recovery of the Fukushima I Nuclear Power Plant. The plan seems to be that the no-entry zone will be reorganized into three different zones depending on the cumulative [external] radiation exposure levels per year. If the annual cumulative radiation exposure is to be 50 millisieverts and above, the areas will be designated as "difficult to return for a long time"; the areas between 20 and 50 millisieverts as "restricted residence", and the areas below 20 millisieverts as "preparing for return". The national government is said to have been discussing with the municipalities affected, and to disclose its thinking before the year-end. To be more precise, in practical terms, on the "declaration" of the completion of the step 2, whether the so-called "step 2" has been achieved or not. As long as you declare. According to Yomiuri Shinbun (12/15/2011) on the subject, a NISA official told the mayor of Tomioka-machi the reason for lifting the evacuation order as Fukushima II fully prepared for disaster with "external power source secured and emergency generators equipped". The mayor of Naraha-machi has been itching to restart Fukushima II Nuclear Power Plant and get "genpatsu (nuke plant)" money flowing again. He may get his wish soon. When the national government talks about "radiation" in these areas, it is talking about external radiation only, and at 1 meter off the ground. The latest survey result (12/13/2011) by the Ministry of Education and Science is here. The highest is Watari District in Fukushima City, close to 20,000 becquerels/kg of radioactive cesium. Kashiwa City in Chiba and Ichinoseki City in Iwate, about 200 kilometers south and north of Fukushima I Nuclear Power Plant respectively, also tested rather high, with close to 6,000 becquerels/kg of radioactive cesium. ACRO used Osaka as control. No mention of whether other nuclides were tested or found. ACRO has analysed dust of vacuum cleaners from 13 dwellings. Excepted Osaka, chosen as a reference because it is located 600 km from the plant, all dust samples are contaminated with cesium 137 and 134 following the catastrophe of Fukushima. It is in the district of Watari of Fukushima-city that the contamination is highest with almost 20,000 becquerels per kilogram for both cesium. This district, located about fifty kilometres from the plant, is known to be particularly contaminated and the sale of rice is prohibited. Homes are also significantly contaminated in Ichinoseki in Iwate province to the north and in Kashiwa in Chiba to the south, situated in the northern suburbs of Tokyo. In both cities, located about 200 km of the plant, contaminated dust is nearly 6,000 becquerels per kilogram. We don’t know from when the dust was collected by the vacuum cleaners. In Japan, one removes shoes before entering home. I have written about the dynamic duo of Osaka who are very eager to help those poor people in Tohoku buried under the mountains of disaster debris which happens to be radioactive. Now, apparently without further interference from pesky citizens who try to stop them from bring the debris all the way to Osaka to be burned and buried, the committee of select experts have agreed on the safety standard to be used in accepting and processing the debris throughout Osaka, and the governor is to come up with the detailed guidelines by the year-end. The expert committee of Osaka Prefecture decided on the safety standard to accept the disaster debris and waste from the March 11 earthquake/tsunami. Governor Ichiro Matsui is positive about accepting the debris, saying "As long as it is safe, the entire nation should cooperate so that the disaster-affected area will recover." The governor plans to establish the prefectural guidelines for processing the debris based on the safety standard [decided upon on December 14]. It is expected that the municipalities in Osaka will be asked to cooperate. The expert committee made up of radiation expert agreed as appropriate on the level of radioactive cesium in the debris at 100 becquerels/kg and less to accept the debris, and the level of radioactive cesium in the ashes after the debris is burned at 2000 becquerels/kg and less, stricter than the national standard of 8000 becquerels/kg and less. However, even if Osaka Prefecture decides to accept the debris, it is not clear whether the municipalities with incineration facilities will cooperate. The Osaka prefectural government has so far received about 12,000 messages from Osaka residents who are against accepting the debris, and it is possible that the debris acceptance may encounter complications. I will persuade the residents until they give up and say "OK, no other choice". There you have it. They will keep at it until the residents become so weary that they simply give up. Worked every time in the past. And never mind that their math is wrong; debris with 100 becquerels/kg of radioactive cesium in the debris will become ashes with 3300 becquerels/kg of radioactive cesium, exceeding the just-established Osaka limit of 2000 becquerels/kg. I guess they are not too worried about details. This one may actually work, if they can do it on a large scale. But I just can't visualize how. A university researcher and his friend have come up with a cesium removal system from fallen leaves using a coffee filter. Eisaku Katayama, 62-year-old researcher at the Engineering Department of Chiba University and former Professor of Tokyo University Medical Research Institute, and Isamu Kawakami, 63-year-old executive at a building firm in Shibukawa City in Gunma Prefecture have come up with a system to completely remove radioactive cesium from fallen leaves and weeds. They discovered that cesium binds to "plant opals" in leaves and stems of plants, and succeeded in removing cesium by removing the plant opals. Katayama is hopeful that their system "can be used in a variety of decontamination work". The two focused on the characteristics of radioactive cesium which strongly binds with minerals whose main ingredient is silicon compound such as mica. Since plant opals contain the silicon compound, they hypothesized that the similar phenomenon may happen with the plant opals and conducted the experiment. First, they put 570 grams of weeds from Minami Soma City, Fukushima Prefecture in a sealed container in mid November. After letting it rot until liquefied, they measured the density of radioactive cesium on December 10. The result was 28,924 becquerels/kg. They added water to this weed sludge, and filtered it using a coffee filter. They found that radioactive cesium was not detected from the filtered water. Upon close inspection of what remained on the coffee filter using a microscope, they identified numerous plant opals. They concluded that radioactive cesium had chemically bound with plant opals, and didn't go through the filter. The dreg left on the filter was about one-tenths of the weeds. It contains concentrated level of radioactive cesium, but they want to develop a system to process a large amount of fallen leaves and weeds, as the system may be able to reduce the bulk of the leaves and weeds that takes up storage space. A plant opal is a particle between several and 100 micrometer in diameter. It gets detached from fallen leaves and scatter. Katayama points out that it is necessary to store fallen leaves and weeds in an enclosed area and not in the open, and to wear masks in the contaminated areas with many plants. Katayama and Kawakami became friends through their common hobby, astronomical observation. After being consulted by his friend in Fukushima Prefecture on decontamination, Kawakami did the research, with the help of Katayama. Katayama says, "It should have been written up and published as a research paper, but for the sake of the disaster-affected areas we'll put developing the practical application first." If only radioactive cesium were the only nuclide that fell. Dec. 13 (Bloomberg) -- Iran's military is set to conduct drills for closing the Strait of Hormuz, a bottleneck for oil exports from the Persian Gulf, the state-run Fars news agency reported, citing parliamentarian member Parviz Sorouri. "Soon we will hold a military maneuver on how to close the Strait of Hormuz," said Sorouri, a member of the national security and foreign policy committee, according to Fars. "If the world wants to make the region insecure, we will make the world insecure." His comments first appeared yesterday on the website of the state-run Iranian Students News Agency before the report was withdrawn without an explanation. About 15.5 million barrels of oil a day, about a sixth of global consumption, flows through the Strait of Hormuz between Iran and Oman, according to the U.S. Department of Energy. Still, crude oil went from $100 pre-US market to $95, as the global de-risking continued today, hitting commodities extra-hard. I hope whatever drill that they plans to do will start and end without incident. (UPDATE) The Ministry's other release says the measurement in Fukushima was done in July, therefore no detection of iodine-131 or any other short-lived nuclides. The Ministry sat on the data for only 5 months then. or 47 times as much as all the 45 prefectures (excluding Fukushima and Miyagi) combined. Or 145 million times as much as the pre-accident annual number for Fukushima, in half a month. It took only 9 months for the Ministry of Education and Science to finally disclose the number for Fukushima Prefecture. The Ministry is yet to say anything about Miyagi Prefecture. The ostensible reason for not disclosing the numbers for Fukushima and Miyagi has been that the measuring stations got damaged by the earthquake. Well, by releasing the data, albeit very late, the Ministry makes it rather clear that the measuring station in Fukushima was just fine, and it had the data. Still, the number is only for radioactive cesium (134 and 137). No word about radioactive iodine, or about any other nuclide. Regarding the radioactive cesium that has been released into the atmosphere as the result of the Fukushima I Nuclear Power Plant accident, the Ministry of Education and Science announced on December 14 that the cumulative amount of radioactive cesium fallout in 4 months after the accident in Fukushima Prefecture was 6.83 million becquerels/square meter. The Ministry announced the cumulative amounts of radioactive cesium fallout for the 45 prefectures last month, excluding Fukushima and Miyagi. The amount in Fukushima is 168 times as much as that in Ibaraki Prefecture (40,801 becquerels) which had the highest amount among the 45 prefectures, and 47 times as much as the amount for the 45 prefectures combined (144,446 becquerels). The numbers are the cumulative numbers, measuring cesium-134 and cesium-137 from the dusts collected in containers at institutes of public health throughout Japan from March to June. The analysis for Fukushima Prefecture was delayed because of the March 11 earthquake/tsunami. The measuring location was in Okuma-machi where Fukushima I Nuclear Power Plant is located. Of the 6,836,050 becquerels that fell [between March and June], 94% fell during March, attesting to the severity of the situation right after the accident. There was nuclear fallout from the past atmospheric nuclear testing before the Fukushima accident, but the cumulative fallout for Fukushima for the year 2009 was 0.044 becquerel. For the entire year of 2009, Fukushima had 0.044 becquerel of radioactive cesium fallout. In March of 2011, it had over 6.4 million becquerels. That's 145 million times more than the pre-accident level for a year, in half a month. The Ministry of Education and Science's press release on December 14 (Japanese only) simply states the reason for the disclosure now as "The results just came in", on top of page 2. A smart move by the Ministry, I suppose, to disclose the worst number (in Fukushima) first before disclosing the number for Miyagi, which I suspect to be much higher than that of Ibaraki. Now that France's AREVA is in dire financial trouble, Toshiba may have one less competition in selling nuke plants all over the world. And when a nuke plant goes bust, like Fukushima I Nuclear Power Plant did in a spectacular fashion, why it makes more money by first selling cesium towers (SARRY) which have so far delivered OK performance but not that great, then selling a desalination system (evaporative condensation apparatus) that keeps leaking water. Now, Toshiba is set to make money in the "decon bubble" in wider communities outside the nuke plant by introducing a camera that can visualize radiation levels in different colors. According to the Asahi article below, it has been tested in the harshest environment - Fuku-I compound. Toshiba announced on December 13 that it has developed a camera that can show different radiation levels in different colors. The company says the camera will help identify so-called "hot spots" with localized high radiation and improve the effectiveness of decontamination work. The company plans to market the survey service using the camera to the Ministry of the Environment and local municipalities, starting next year. The camera contains a sensor that measures radiation and a sensor that captures graphic images. By combining two signals from the two sensors and sending the signals to the computer screen, the system allows users to visualize radiation. The locations with high radiation levels will be displayed in red, making it easier to identify "hot spots" than the traditional display of radiation in digits. The Toshiba-made camera with almost identical capabilities has been used inside the buildings at Fukushima I Nuclear Power Plant. The company has improved that camera by raising the sensitivity and reducing the size and weight by half, making it easier for local municipalities to use. 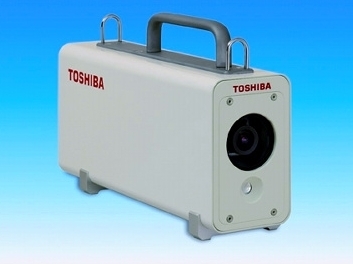 Toshiba will conduct a joint experiment with Fukushima City before the year end, and commercialize the camera. If there's a demand from municipalities, the company will consider the sales of the camera itself. This time, Heita Kawakatsu, the Oxford-grad governor of Shizuoka Prefecture, is using young Shizuoka people to push his radioactive tea to New Yorkers instead of going there himself. Wanting to completely dispel the baseless rumors after the Fukushima I Nuke Plant accident, representatives from Shizuoka Prefecture, the largest producer of "ara-cha" (bulk tea) in Japan, served "fukamushi-cha" [tea made by steaming the leaves longer) at a Japanese confectionery store in the center of New York City on December 12 as part of the PR event to appeal safety. After the nuclear accident, some of the teas produced in Shizuoka were found with radioactive cesium exceeding the provisional safety limit set by the national government. However, the event was to educate [the US] consumers that there would be no effect on health if they drank teas that were being sold in the marketplace. Arianna Solomon, 17-year-old high school student, enjoyed the Shizuoka tea. "My grandmother drinks Japanese tea every day. I like it too." "Some" Shizuoka teas were indeed found with radioactive materials exceeding the Japanese provisional safety limit (500 becquerels/kg). What the newspaper fails to mention is that radioactive cesium was found in almost all the Shizuoka teas tested. The US peacetime limit for radioactive cesium in water and drinks is 3.0 picocuries, or 0.1 becquerel/liter. The same for food is 170 becquerels/kg. The US FDA has the Derived Intervension Level (DIL) which is 1200 becquerels/kg, and the level of concern at 370 becquerels/kg to govern the domestic food in interstate commerce and the imported food as a non-enforceable "recommendation". But this is NOT a nuclear emergency for the United States, in which the citizens would suffer without food and drinks if the government did not raise the limits for radioactive materials in food and drinks in interstate commerce or from import. Scanning the official webpage of Shizuoka Prefecture where the results of tea testing are published, you'll notice that testing seems to have been one bag at one tea plantation in one city. We know how well the similar testing of rice in Fukushima Prefecture has turned out to be. Shizuoka's webpage has a limited number of tests on brewed tea, using 10 grams of dried tea leaves and brewing for 60 seconds with 430 milliliters of water at 90 degrees Celsius. The results are between 1.6 and 14 becquerels/kg of radioactive cesium in brewed tea. I drink 3, 4 cups of green tea every day. That's about 500 milliliters per day. If I were drinking the Shizuoka tea that had 14 becquerels/kg of cesium after it was brewed, I would ingest 14 becquerels of radioactive cesium every two days. In one year, I would have 2555 becquerels of radioactive cesium total, more than half of which would be retained in the body, looking at the ICRP chart below (from ICRP Publication 111). I think I'll stay away from teas grown in Shizuoka, or anywhere in Kanto region, but it's my personal decision based on the information that I have digested since March 11. Canada Formally Withdrew from the Kyoto Protocol: "Kyoto Is an Impediment"
OTTAWA — Canada became the first country to formally withdraw from the Kyoto Protocol, saying the pact on cutting carbon emissions was preventing the world from effectively tackling climate change. "We are invoking Canada's legal right to formally withdraw from Kyoto," Environment Minister Peter Kent said following a marathon UN climate conference in South Africa, at which nations agreed to a new roadmap for worldwide action. The landmark pact reached in 1997 is the only global treaty that sets down targeted curbs in global emissions. But those curbs apply only to rich countries, excluding the United States, which has refused to ratify the accord. "Kyoto is not the path forward for a global solution to climate change," Kent said. "If anything, it's an impediment. "We believe that a new agreement with legally binding commitments for all major emitters that allows us as a country to continue to generate jobs and economic growth represents the path forward." Canada agreed under the Kyoto Protocol to reduce CO2 emissions to 6.0 percent below 1990 levels by 2012, but its emissions of the gases blamed for damaging Earth's fragile climate system have instead increased sharply. Saying the targets agreed to by a previous Liberal administration were unattainable, Conservative Prime Minister Stephen Harper's government last year unveiled its own measures aimed at curbing emissions, in line with US efforts. Pulling out of Kyoto now allows Canada to avoid paying penalties of up to CAN$14 billion (US$13.6 billion) for missing its targets. Kent also cited major impacts on Canada's economy that will be avoided by withdrawing from the treaty. "Under Kyoto, Canada is facing radical and irresponsible choices if we're to avoid punishing multi-billion-dollar payments," Kent said, noting that Canada produces barely two percent of global emissions. "To meet the targets under Kyoto for 2012 would be the equivalent of either removing every car, truck, ATV, tractor, ambulance, police car, and vehicle of every kind from Canadian roads or closing down the entire farming and agricultural sector and cutting heat to every home, office, hospital, factory, and building in Canada." For Kyoto supporters, the anticipated Canadian pullout was expected to be a symbolic blow and badly damage a UN climate process already weakened by divisions. Last week at the UN climate conference in Durban, South Africa, Kent had already said that Kyoto was "in the past" for Canada. "It is an agreement that covers fewer than 30 percent of global emissions, by some estimates 15 percent or less," the Canadian minister said. The conference on Sunday approved a roadmap towards an accord that for the first time will bring all major greenhouse-gas emitters under a single legal roof. But environmentalists have called it porous. Kent said that in the meantime, Canada would continue to try to reduce its emissions under a domestic plan that calls for a 20 percent cut from 2006 levels by 2020, or as critics point out, a mere three percent from 1990 levels. The latest data last year showed that Canadian carbon emissions were currently up more than 35 percent from 1990. Huffington Post: " NRC 'Coup' Leader, Bill Magwood, Consulted For Fukushima Parent Company"
That's TEPCO. This is interesting. Bio of Bill Magwood at the NRC site is here. WASHINGTON -- Bill Magwood, the man at the center of an effort to overthrow the chairman of the Nuclear Regulatory Commission and his most likely successor if the move is successful, served as a consultant for Tepco, the Japanese company that owns the Fukushima nuclear power plant, according to information provided by Magwood as part of his nomination and confirmation process, which was obtained by The Huffington Post. On Friday, Rep. Darrell Issa (R-Calif.) released a letter signed by Magwood and three other commissioners attacking the panel's chairman, Gregory Jaczko, setting off a firestorm in the energy industry. Issa and the four commissioners framed the dispute as personal and managerial, but emails released by Rep. Ed Markey (D-Mass.) 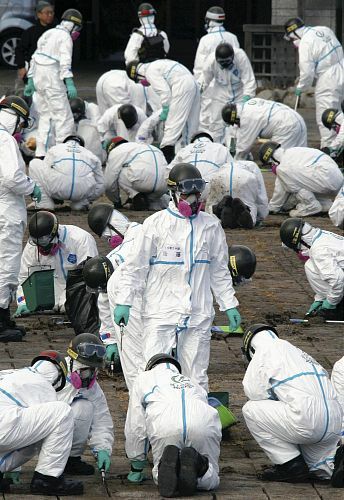 show a political and ideological battle underway over post-Fukushima safety standards. Issa and Markey appeared opposite one another on MSNBC on Monday, continuing to debate whether the issue is one of personality or the politics of nuclear safety. Magwood's previously unreported relationship to Japan's nuclear industry, via the firm he founded and ran, Advanced Energy Strategies, sheds new light on that debate. When Magwood was nominated by President Obama in 2009 to become a commissioner, nearly a hundred environmental groups, along with the Project on Government Oversight (POGO), urged his defeat in the Senate, arguing that he was too close to the industry to be tasked with regulating it. He was confirmed in March 2010 by unanimous consent. Since joining the body, Magwood has coordinated with the two Republicans and the other Democrat on the panel to delay and water down new safety reforms pushed by Jaczko, according to the emails made public by Markey. Following the Fukushima disaster, Jaczko has made a major effort to increase safety standards, an effort that is being closely watched by international regulators and nuclear companies across the globe. Magwood's recent client list makes up a who's who of Japanese power and nuclear companies, and included CLSA Japan Equities Division, the Federation of Electrical Power Companies in Japan (FEPC), IBT Corporation, Marubeni Corporation, Mitsubishi Heavy Industries, RW Beck, Sumitomo Corporation and the Japan Atomic Energy Agency, which was roundly criticized for its response to the crisis. Soldiers of Japan's Self Defense Force are deployed to decontaminate the most contaminated areas within Fukushima Prefecture, cleaning up the municipal offices (quite tellingly). What's their weapon? Japan Ground Self Defense Force soldiers continue their decontamination work at Iitate-mura village office in Fukushima Prefecture. About 300 soldiers wearing protective clothes and face masks were busy scraping the dirt in between the pavement stones using tools like minus screwdrivers and washing the asphalt surface in the village office compound using high-pressure washers. The work, which started on December 7, is scheduled to last for about 2 weeks.